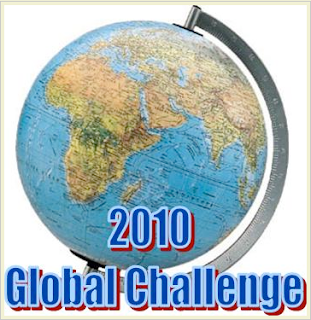 I am going to do the Easy Challenge (one book from each section of the world). Try to find novels from twelve different countries or states. Add two novels which are set in Antarctica. Select novels from fourteen different countries or states. I know what you mean, I've signed up for 3 challenges already and then I saw this post and I thought ohhh I want to do this too! And a historical fiction challenge. I'm trying to promise myself that 5 challenges will be my limit (YA/MG Debut, GLBTQ, South Asian, Historical Fiction and Global Reading). We'll see how that turns out! Now you know why I always say 'I'm open to new challenges', lol! Thank you very much for posting about my challenge. I am looking forward to hosting this one as it is the first time I have tried something like this.